The Parentesi pendant light is an ultra modern ceiling lamp. 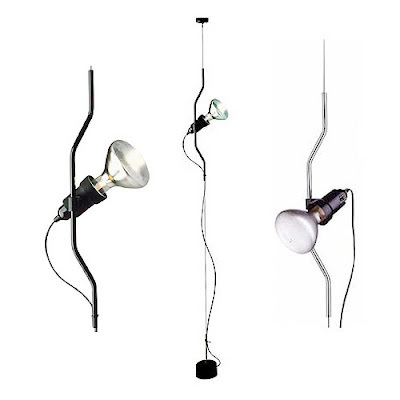 Excellent for spot lighting in galleries or offices or even at home. Designed by Achille Castiglioni and Pio Manzu, and now manufactured by Flos, this lamp is a wonderful and functional design. It is a recipient of the Moma design collection awards. The Parentesi ceiling lamp provides direct light. It moves vertically via sliding of a painted or nickel-plated shaped steel tube on a 13’ long ceiling-to-floor cable (may be cut to size). The fixture head is made of injection-molded black elastomer (UL-94 HB) with the on/off switch. A brilliant design to light up any indoor scenario. It is available in two finishes (black or nickle), one can also add an extra bracket, which is not included in the price.